Umberto Eco once mentioned that two twentieth-century writers offered images for the next millennium: James Joyce and Jorge Luis Borges. 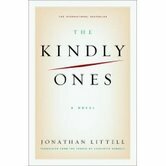 “The first designed with words what the second designed with ideas.” These have come to fruition in Jonathan Littell’s The Kindly Ones. I do not make the comparison lightly. The Kindly Ones is a magnificent modern novel that deserves immediate recognition and canonization; it redefines the war novel and takes language and the dissemination of ideas to a league on par with Joyce, Borges, Pynchon, Proust, and Tolstoy. In brief, it is the story of one man, Dr Max Aue, and his experiences during the Second World War from 1940-1945. Dr Aue is a Nazi and a consummate bureaucrat. He is also a deeply troubled man who subjects himself to no end of personal horrors and, at one point, a self-destructive spiral of pain and self-loathing unparalleled in modern literature. He’s difficult to judge. We’re told time and time again that men are defined by their choices and by their actions, but while you’re reading The Kindly Ones, it’s difficult at times to paint Aue with the same brush as other Nazis and say that you would have things done differently. In fact, the whole first part of the book addresses this very question as the reader is told that Max has got away with it – he’s alive and free in France as late as the 1970s (Vietnam is mentioned), possibly later. The Kindly Ones is not an easy read – it deals with real and modern horrors, if fictional. Following Max’s questions of context and accountability, the first few hundred pages are a gut-wrenching, throat-clenching exploration of the Aktion, the assassination of Jews throughout Nazi territories. Littell’s descriptions are horrifying and difficult to absorb; I know the book has been put down more than once because of them (though always picked up again). Bodies, blood, vermin, and filth – it’s everywhere in this book and at times it is simply unrelenting. Later episodes are horrifying for different reasons, mostly for the nonchalance and bureaucratic details associated with the Final Solution. There’s still horror and terror here, but here it’s colder and complex rather than hot and vicious. It’s already been said that German apathy caused the Holocaust rather than outright anti-semitism. Littell has already won the Prix Goncourt in France for the French-language original book, Les Bienveillantes. This is the English-language translation by Charlotte Mandell. I’ve read bits of the original in French, and while excellent, I honestly feel that the English-language edition hits home. I figure the reasoning is three-fold: my ear is attuned to English more than French; there is a great deal of terminology and associated concepts in German and I feel an English translation serves these words better than the French – if for no other reason, the very last line; an excellent English-language translation. Books can be crippled by lacklustre translations, but Mandell has done an outstanding job. Nothing is softened; all of the pain and horror are there in harsh, English consonants. The Kindly Ones is released in Canada and the United States at the start of March. It deserves to sell every copy. Next Post Scotty G’s Box Office Predictions for the weekend of Feb. 20, 2009.